Boston Globe editorial, September 2, 1980. 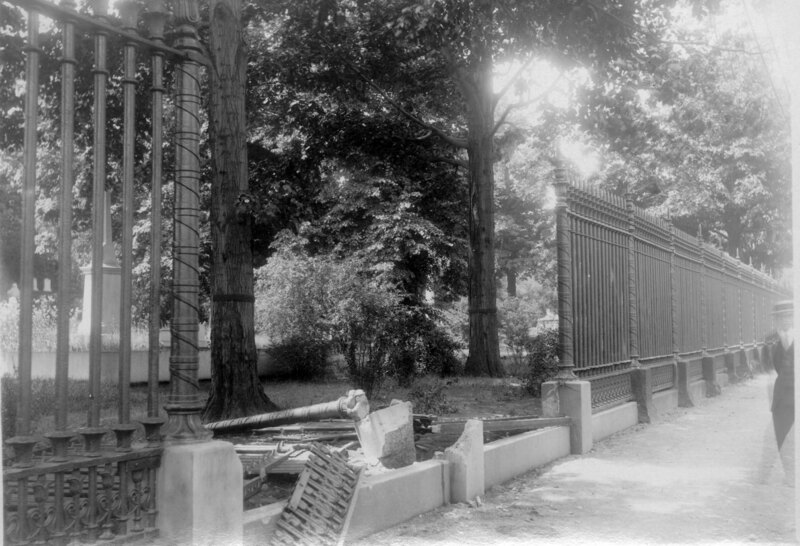 On August 5, 1980 half of the circa 1844 cast iron fence along Mount Auburn Street was removed. A storm of protest followed. Objections came immediately from the Cambridge Historical Commission, SPNEA (Society for the Preservation of New England Antiquities), and Massachusetts Historical Commission. There were floods of letters from neighbors and preservationists – both local and national; an editorial in the Boston Globe, and letters and stories in newspapers and on TV. SPNEA threatened legal action. On August 12, Mount Auburn president Alan Chesney, other Trustees and the Cemetery’s legal counsel met with Nancy Coolidge (SPNEA) and Charles Sullivan (CHC) and agreed to halt the removal of the fence pending further study. Damage from 1920 car crash. Photo by Arthur C. Haskell. After meetings and studies, Mount Auburn agreed to restore enough of the original fence to place 65 feet on either side of the Egyptian Revival Gate. The City of Cambridge designated this Entrance area a Cambridge Landmark. The remainder of the fence was replaced with 2,600 feet of green vinyl-covered chain link. Some of the anger of the preservationists had been that the Cemetery had not asked for public help to care for this historic fence. 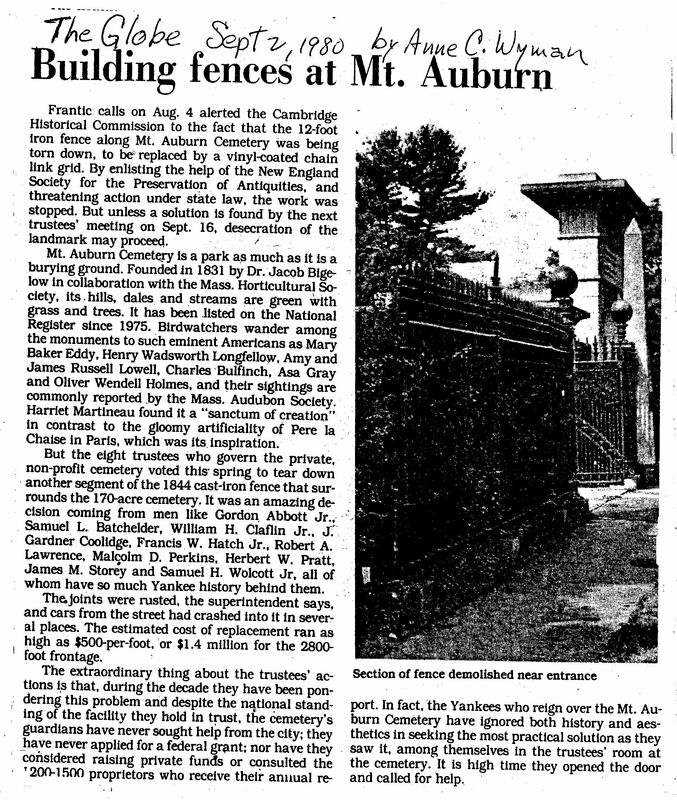 In November 1982 the Cemetery invited all who were interested to a gathering to inspect the restoration work of 14 sections of the iron fence and the newly refurbished Entrance. 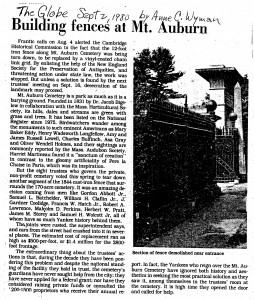 And the community interest in the “fence controversy” led to the creation of the Friends of Mount Auburn in 1985. Wow, great story. 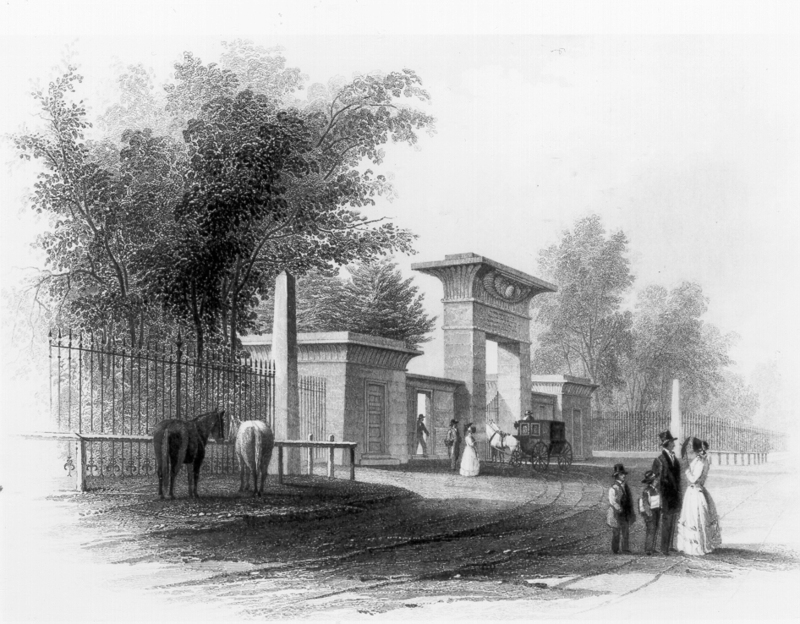 It’s amazing that the cemetery at that time would not have realized the interest of the public in preserving that iron fence. In those pre-internet days, it must have been much harder for Joan and Joe Q. Public to figure out what’s going on and mobilize support/opposition in time to change a project already underway. Thank you, historic preservation rabble rousers of the ’80’s, for your efforts. p.s. What is the status of the perimeter fence now? I have not noticed any vinyl-covered chain link sections. I remember being shocked when the old fence was replaced by the green chain-link, and didn’t understand why it wasn’t replaced with a replica of the old fence. I am now older and wiser and understand the financial reasons why it was done, but I still wish each time I pass, and that is often, that the old fence could be replaced with a facsimile. It was so beautiful as is the cemetery. It still seems to be that Mt. 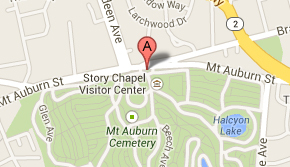 Auburn deserves more than green chain-link. Has there been talk and negotiations about something classier than the chain-link if not a replica?